Yesterday we had a special guest at school. Mr. Cliff Quinn, or Kite Man (as he told the children to call him), came to share his enthusiasm for building and flying kites. He spoke with the second graders about how he had been interested in kite-making since the 1990s, (which must have seemed like a Long Time Ago to these seven- and eight-year-olds) and showed them examples of kites that he has constructed. He told them that some of the kites are made of fabric, and that he enjoys using a sewing machine to fashion the covers. One of the kites that he brought was a large three-dimensional model made of fabric that hung on fiberglass dowels. Their kites would have plastic covers and hang on wooden dowels, he explained. I watched the kids listen with curiosity and excitement. With kite-making materials on the tables where they were sitting, the students couldn’t wait to make their own. The first thing Mr. Quinn had the children do was to decorate the cover. The cover was a sheet of white plastic in the classic diamond shape. The students were instructed to use permanent markers of all colors to draw anything they wanted. Before long, beautiful trees and flowers emerged under friendly, smiling suns. Rainbows and frogs and designs appeared, too. The vibrant colors seemed to light up against the white plastic. Next, with the help of the adults, the students attached the wooden frame to their covers. The dowels had been rubber banded together to form a cross. The students needed only to tape the ends of the dowels to their corresponding corners on the diamond-shaped cover. Once the frame was taped, all that was needed was to attach a plastic streamer tail and a spool of kite string. While the project was very simple, to the students it was a practical work of art. Something that they created would be something that they could use and enjoy, not just look at. Now it was time to go outside to take the kites for a spin. It was a little tough at first, figuring out how to get the kites to stay up. “Run!” we told them. Mrs. L. demonstrated how to get started, and how to let out a little string as the kites picked up some wind. A couple of kids caught on quickly. We (children and staff) admired their skills. For some, it was a little frustrating, but most of the students had some degree of success. Then, right before it was time to come back in, many students figured it out. Many flags soaring just a bit higher. It was exciting for everyone to see. I smiled as I watched all around me on this warm, sunny day on the green grass. 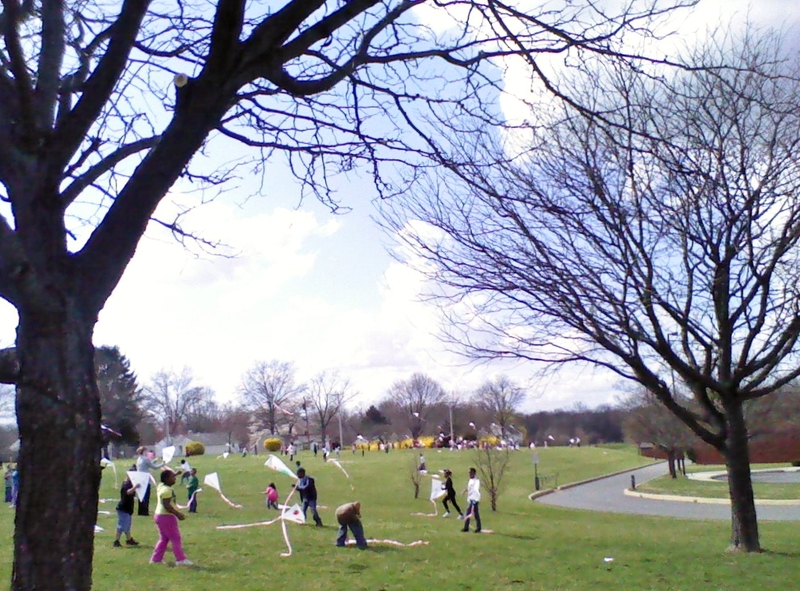 I saw children playing and laughing, flying their brightly lit, multi-colored kites. The feeling I experienced was happiness-joy-freedom-fun. I don’t think I can limit the feeling to one word – I really need four words, at least. To me, a couple of students described the afternoon as being “the best day ever”. Isn’t that terrific feedback? Doesn’t that sound like a happy child? We need to have more days at school like that. We need more happiness-joy-freedom-fun days. And why not? Why shouldn’t school and work be places to which we enjoy being? we spend so much of our day at school or work, and so much of our life there, as well. So thank you, Mr. Quinn, for bringing your happiness to school to share with all of us! The joy you feel from your hobby had a domino effect and made for a warm, wonderful afternoon enjoyed by second-graders and those of us who remember being second-graders. You introduced a new simple pleasure to our children, and reminded we older ones that kite-flying is a simple pleasure that you are never to old to do! Bravo! Putumayo World Music The official blog.